An interactive whiteboard resource designed to assist teaching simple number sequences. A new sequence can be generated instantly. Each number of the sequence can be revealed one at a time to allow class discussion about what could be next. 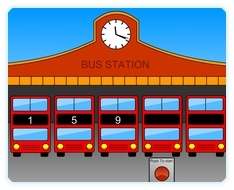 The resource will generate either an addition or subtraction sequence on the bus numbers. Due to the simplicity of the sequences generated this resources is probably best used with younger children and the visual presentation reflects that. This resource also has sound so ensure the volume is set appropriately. Go to interactive whiteboard resource. A sheet containing rows of blank buses is attached to allow students to record the sequences on paper as they go. This is good for Y3 as a starter. Is there anyway the buses could drive off at the end of the sequence if the children get it right? Just a suggestion.